Some of you may know I have started going to the gym this year, but I haven't been doing so lately after my brother bought a treadmill. A little background information: I used to visit the gym once a week for an hour. Initially, my aim was to train abs, but I gave up eventually... hahahaha~ Most of the time, I do light workouts; I try not to exercise too much or too vigorously because I am underweight (154cm tall and weigh 38-39kg = BMI 16.0~16.4). 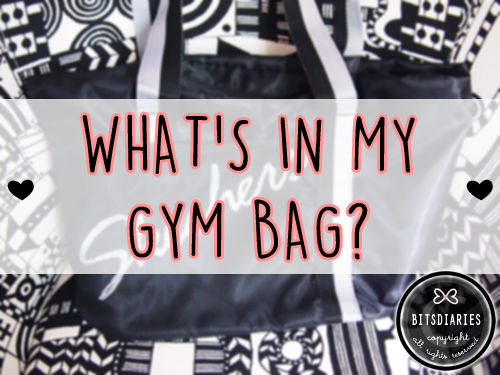 Anyway, to the readers who requested this topic — "What's In My Gym Bag", here you go! 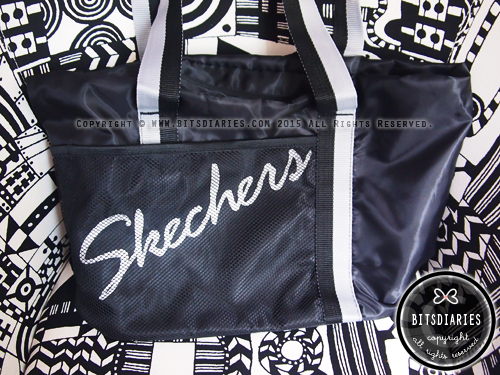 This is the bag I bring to the gym and it is from Skechers. It was a freebie when I signed up for the limited edition SG50 PAssion POSB Debit Card. 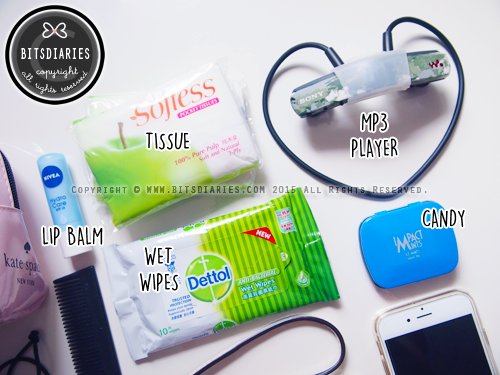 So these are the basic things I always pack in my gym bag. 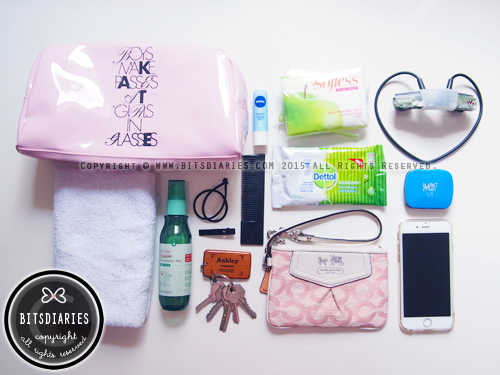 - A pouch from Kate Spade and I use it to keep my towel and facial mist (Etude House AC Clinic Intense Hinoki Water Mist review). 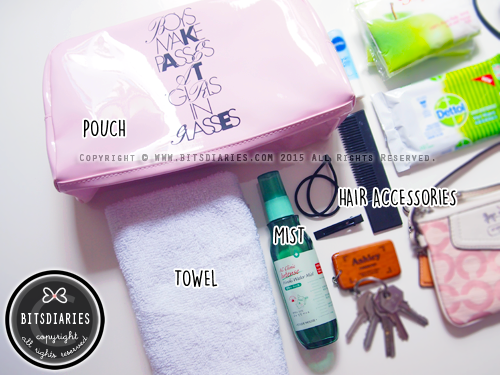 - Hair accessories — A comb, hair clip and hair tie. - MP3 Player from Sony W-series — NWZ-W252 (Metal Gear Solid Peace Walker limited edition model in Camouflage). I must say that the sound quality of Sony W-series is not as good as Beats; but it is a perfect companion for the gym because it is lightweight and best part, it is wire-free, water-resistant and washable! Ideal for sports use. - Impact Mints Candy in the flavor of Ice Mint. My all-time favorite candy! 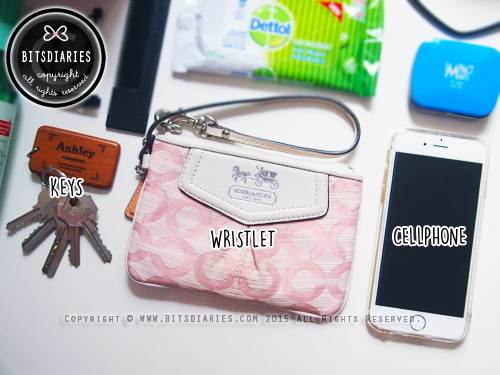 - Wristlet from Coach to keep my money. I usually bring only SGD$10 to $20. - My cellphone — Iphone 6 (Champagne Gold). - Water Bottle from Thermos to keep my hydration levels up. 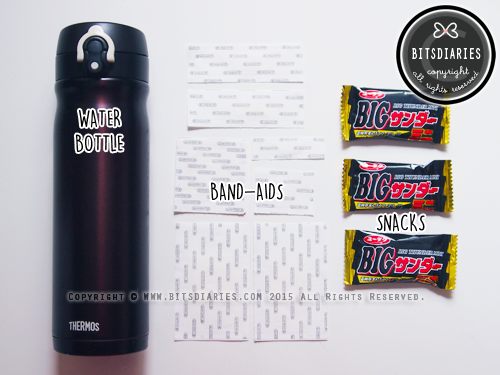 - Band-aids in different sizes. In case of injury. 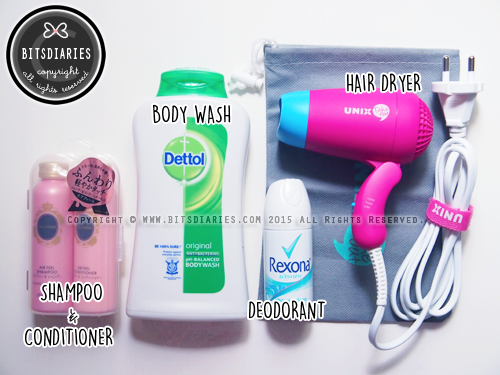 - Rexona Deodorant in my favorite scent, "Shower Clean"(Travel-size). ... as well as the following things, which I did not take a picture of. As the gym is close to where I live, I don't usually take a shower there. I would only do so if I am meeting my friends for lunch/dinner right after gym.